Creating video games – that’s the dream of a huge amount of people worldwide. If you’re a fan of video games, then all it takes is a single look at companies like Bethesda or Jagex (or Riot or CD Project Red) to understand why people would want to work there. Truth be told, becoming a game developer is no easy feat – you have to really set your mind to it and focus on learning all of the complex information required. Today we’re not going to talk about the ways of becoming a game creator, however. No, today we’re going to talk about the game developer salary – what you could expect to earn from a dream job. If you’re reading this, then you probably know everything there is to know about game development (at least the processes that it involves). However, I will still talk briefly about the craft – what game developers do, what responsibilities they have, etc. Then we’ll talk about the main types of web developers, and after that, we’ll dive straight into the numbers. So then, let’s take it from the top and talk about what exactly is a game developer and what do these people do. As the title probably implies, game developers are mostly concerned with, well… developing games. However, the reason why I brought this topic up in the first place is because these people usually do so much more than that. Even though game developers tend to focus on the technical aspects of game creation (coding/programming work, technical testing, etc. ), they often help out with concept creation or even creative writing, as well. Game developers are often seen as very universal employees of a company. They possess a wide skillset, which allows them to fit into almost any role if such a need would present itself. That being said, this leads to game development being a really difficult profession to master, having to need to learn all of those different skills in order to be successful. On the flip side, however, the video game programmer salary should represent that. As you’re probably aware, different jobs can have different titles attached to them. And no, I’m not talking about the job title itself, but rather the tag that comes along with it. These tags are most often used to represent the employee’s skill level in his or her field of expertise. So, for example, imagine that you were to go and work as a driver. If this was your first job of this kind, you would probably be called a beginner driver. If you’ve already spent the bigger portion of your life driving cars, however, you might get the title of a senior driver (no pun intended). Does it make sense? These tags aren’t only there to add extra words to your job title, however. Depending on the tag, you can expect to receive a different salary, different working terms and conditions and, naturally, different tasks to perform and carry out. The game developer’s job is no exception to this rule – these developers also have different sub-titles that represent their experience and time spent in the field of game development. Since these titles mean so much and are not only there for some sort of a visual appeal, let’s take a closer look at the three main tags that a game developer can possess. After that, we’ll move on to covering the video game developer salary. As with most other jobs out there, the very first group of game developers that you might encounter are entry-level, or beginner ones. Beginner game developers are usually either high-school or university students that have just recently gotten into game development and want to try their luck with this specialty. 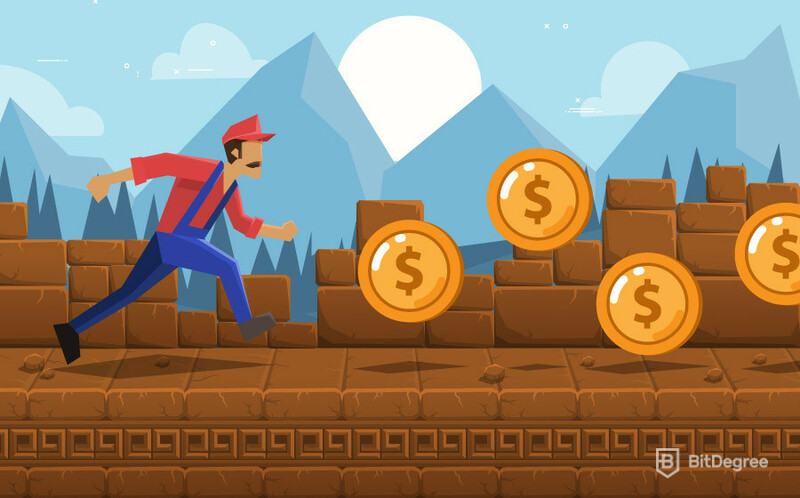 If you’d have a dream of becoming a game developer and earning a great game development salary, the very first bits and pieces that you would learn about programming could yield you the title of an entry-level game developer, if you were lucky enough to score a job at that stage. Entry-level developers have the lowest game programmer salary out of the three groups (naturally), but they also have the least amount of work to worry about. Basically, the only thing that should concern these people is to constantly keep on learning – and employers know that! This is why they give beginner employees introductory tasks that wouldn’t overwhelm them, but would also be a great learning experience at the same time. If you’ve heard it once, you’ve heard it a million times before – the junior group of employees is the most difficult one to talk objectively about. I stress this every single time whenever I talk about this group of people, and junior game developers are no different. I will talk about the reasons for why that’s the case a little bit later on in the article when we look at the junior video game developer salary. If you find yourself constantly wondering how much do game designers make, then the junior group of developers is probably going to be the very first thing that comes to your mind. They can be considered the “stereotypical” type of game programmers – whenever people think or talk about computer game creation, huge game creation studios or the video game programmer salary, junior game developers are the ones that get referenced the most. And that isn’t at all surprising – it is the most commonly known and encountered group of the three. Junior game developers are people who have found a stable job in a company and have now started to climb their career ladders. They still have a lot to learn, but can already find their way around the code and perhaps even help out with other, secondary tasks that might come up. Even though it would be logical to think that the junior video game developer salary should represent a great average of what game designers make in general (seeing as it is the middle group of the three), that is not always the case. But again, we’ll talk about that when we approach the topic of the actual video game programmer salary itself. Until then, we still have one group of game developers to cover. The “final boss” of game development, senior game devs are are the people who possess the biggest amount of experience in the field of game development. These veterans have been through thick and thin, have seen both hot and cold and are basically universally prepared for any situation or problem that might arise in their area of expertise. Senior game developers are usually the people who have chosen to stick with a single company for an extended period of time (at least this is the most common type of a scenario). Usually, these developers have an already-established reputation in the industry which they have spent countless years trying to build. Company-vise, senior developers are most often tasked with some of the toughest and most complicated assignments. More often than not, these developers are the only ones capable of handling such tasks. In addition to that, a senior programmer may also be asked to teach industry and company newcomers all of the tropes that come along with this job. If you’re wondering (on the senior level) how much do game designers make, then I can tell you – the most out of all of the three groups (duh). However, if you’re interested in numbers – read on, since we are finally going to talk about the video game developer salary. Now that we’ve covered both the game developer’s job description and the different types of this profession that there are (at least the main ones), we can finally transition and start talking numbers. We’ll start off by talking about the entry-level game developer salary and then make our way from there. As a point of reference, I will be mentioning the average monthly salary in the US. As of writing this, it is around the mark of $3700 USD. Even though the beginner game developer salary is the lowest of the three, there’s still a popular opinion that it’s pretty good. Well, the time of speculation is over – I’ll let you decided on your own. According to PayScale.com, an entry-level game developer salary tends to be around the $60,500 USD mark ($5040 USD per month). If you were to compare this with the monthly salary in the US, you could say that that’s a pretty good pay! 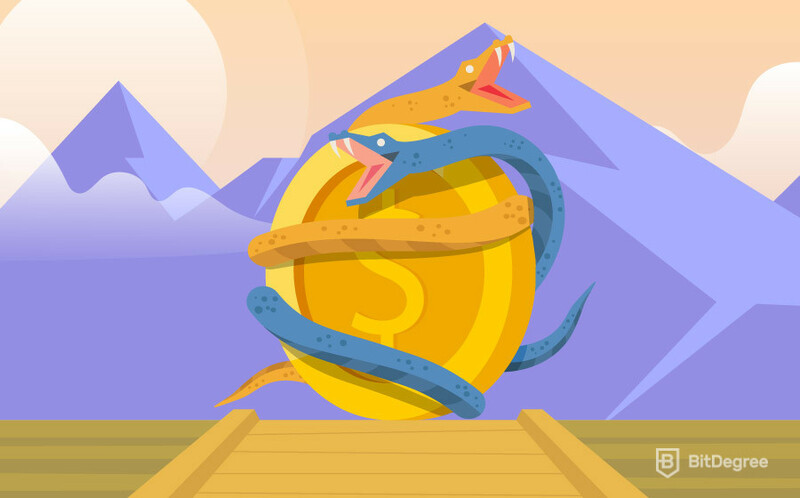 If complete beginner game developers get paid over $5000 USD per month, one thing is pretty obvious – this career path is truly a difficult one! Many people think that, since games are really relaxing (often times, at least) and fun, a job as a game developer is going to be a breeze! That couldn’t be further from the truth – as I’ve mentioned at the beginning of this article, game development is no easy feat. So, I promised I would tell you about the difficulties of analyzing the junior group of game developers. Long story short – it’s really difficult to estimate a stable annual salary that these people could expect to receive since there’s a lot of fluctuation constantly happening. Now, let’s flip the tables and do a short story long kind of a thing. Needless to say, the junior group of game developers is very broad. Being the middle one, you have people from both the beginner and the senior groups mixing in. Since there are no predefined conditions which would transfer you from a beginner group to the junior one (or from the junior group to the senior one), you might have a different mix of people at any given time. For example, today the junior group could consist of a majority of soon-to-be-senior game developers, but tomorrow there could be a majority of no-longer-beginners. Does that make sense? Since the group is so broad, the junior game developer salary also tends to vary a lot. 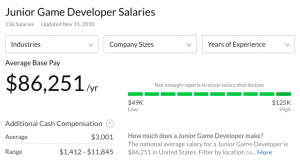 However, as of writing this article, Glassdoor.com estimates that the junior game developer salary should range somewhere around the $86,200 USD annual mark ($7180 USD per month). Keeping everything in consideration, that’s a pretty good number that we’re speaking about! Finally, we reach the senior game developer salary. This is the number that most people reference when they talk about how much do game designers make. And not without a reason – even when compared with the beginner and junior groups, it’s quite impressive. 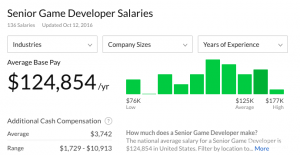 GlassDoor estimates that the average senior game developer salary is almost $125,000 USD ($10,400 USD per month). That’s an incredible salary that we’re talking about! However, you should keep one thing in mind. It’s pretty easy to look at the numbers and be amazed, but do consider the fact that senior game developers have dedicated their lives to the craft. Having said that, if you’re really passionate about the gaming culture in general, and it’s something that genuinely interests you, then it might just be a dream job indeed. Creating games for a living is truly a dream come true for many people worldwide. Even though it truly is a difficult and multilayered skill to master, this doesn’t put off the biggest enthusiasts of the craft. Truth be told, however, that the game developer salary is also a pretty good motivator. If you’re thinking about becoming a game developer yourself – listen to your heart! If gaming is something that is always on your mind, and you spend most of your free time coding and researching the topic of game development, you might just be the next great game developer in the making! Whether you yourself are thinking about becoming a game developer, or you’re simply interested in the game developer salary – I truly do hope that this guide was useful and informative to you. If you do, however, decide to follow the path towards becoming a senior game developer – I wish you all the best of luck!